I am a young woman aged twenty and living in Dzivaresekwa Township, Harare, Zimbabwe. I am the second-born in a family of six, our mother, four girls one boy.My father deserted my mother and the family in 2005 running away from the responsibility of taking care of us. It was that time of severe economic hardships in Zimbabwe and he went out of Zimbabwe. Our life changed totally after my father had ran away because the bread winner was now gone, and my mother was unemployed. Life became very tough. My elder sister Vaidah was in grade five in primary school, I had just started grade one and my mother had just given birth to my little sister Lilly. I remember at some point in 2006, we were left as a child-headed family – Vaidah being the responsible “family head” at 12 years of age – when my mother was working as a house maid and she would come back home only on weekends. After she lost that job, she started doing part-time jobs in the neighbourhood. She would labour in the fields, do laundry and ironing amongst other household chores. At this point payment of school fees were the least of mother’s worries. Food and rentals were the most important things in our family. During this difficult period, it was hard for my mother to provide the three basic meals a day, so we normally had two meals or even only one some days. In a week my sister and I could go to school three times only because the teachers would chase us away from school time and again due to unpaid fees. Therefore, to avoid the embarrassment of being told that you have not paid fees for 2 or so years we would not go to school at all! In order to cover up for some debts at school my mother was asked to cut grass in the school grounds, help in cleaning the toilets and some manual work that needed to be done. I felt the pain of my mother not being able to pay fees. I was discriminated at school, not exactly what a little girl was supposed to deal with at that time. This happened for four years when I was in primary school. My sister Vaidah was doing very well at school and her teachers always gave her a chance to try any scholarship opportunity that would come by. Some of the scholarships were not reliable and they would not pay the fees. 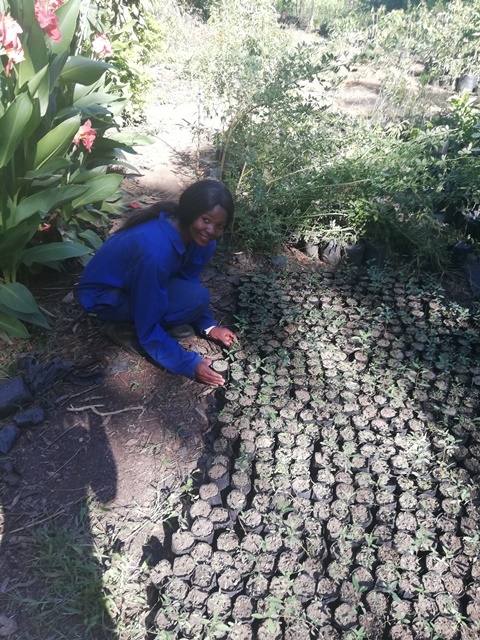 Fortunately, her last year in primary school, grade 7, her teacher introduced her to Dzikwa Trust Orphans Support Programme along with other needy students in her class. At this point Dzikwa Trust ignited hope in our family we were glad that one of us had been given a chance to pursue her dreams and this would make a difference. She passed her grade 7 with 9 units in 2008, and she was full accepted into the Dzikwa programme. I realized that access to education was our only hope. Throughout 2008, I kept on visiting Dzikwa Trust since my sister was now a beneficiary. We would go to the Dzikwa kitchen where we would both get one hot meal a day. My situation at school did not change at this moment. Every now and again I was sent back home to collect school fees which my mother did not have. She was now a full-time vegetable seller where she would wake up at 4 am to go and get fresh produce from the market for resale. I would then spend most of my time helping her out selling the vegetables every afternoon and to look after my little sister. Dzikwa Trust Founders, Seppo and Oili constantly visited our family and they would find me at home every time. I would envy my sister who was now going to school full time, being paid by Dzikwa Trust and getting everything that she needed at school. We would end up sharing the stationery she got from Dzikwa Trust. I did not have enough time for school work, and this affected my performance. Finally, in 2009, I was accepted into the Dzikwa Trust Education Support Program doing Grade five. It was then that I found refugee under the care and educational support of Dzikwa Trust Fund. This was a complete turnaround in our lives and my future was rewritten! In 2010, Lilly was accepted into the programme when she was doing Grade 1. She joined the Dzikwa Trust performing arts training and she is still doing well in school and in the Dzikwa Culture Group. Lilly is now in Form 2 already. Our family grew bigger in 2012 when my mother decided to take her niece Gladys to live with us. Her father died when she was very little, and her mother died in 2010. My mother feared that as a girl child she was so vulnerable at that time and anything could happen to her. Gladys lived with us, but my mother could not send her to school. Dzikwa Trust then accepted her into the program in 2013 and she continued with her primary level studies at Dzivaresekwa 4 Primary School. Gladys is now in Form four. In 2011, Dzikwa Trust launched a single mothers’ handicraft programme and we were very fortunate that my mother was chosen to be part of the team. They did a 6 months training and it happened that she became the project leader. Our family now had a stable source of income that was complemented by other part time jobs. At this time, we were 3 girls in our family, but my mother felt that she needed another child and God willing a boy. In our African culture a family is said to be incomplete if there isn’t a male child who will act like a father in the future. This kind of mindset was still in her and she decided to have a child with my uncle. She did this saying that she did not want to have another child from a totally different family lineage. In 2012, my little brother Nicholas was born. We were now 6 people living in one room, renting a 2.5 x 2.5 metres room. A total of 6 families renting a seven roomed house. My mother could not go and live with my uncle because he had his own family and had not planned on getting married again. My uncle’s wife was not happy with the situation and she said that they were not going to support my little brother in any way since it was done without her approval. In any case, we were not happy with the idea of being incorporated into someone’s family after what we had gone through for years without their help. I continued my secondary level education at Dzivarasekwa 1 High School, where I did my Form one and two. 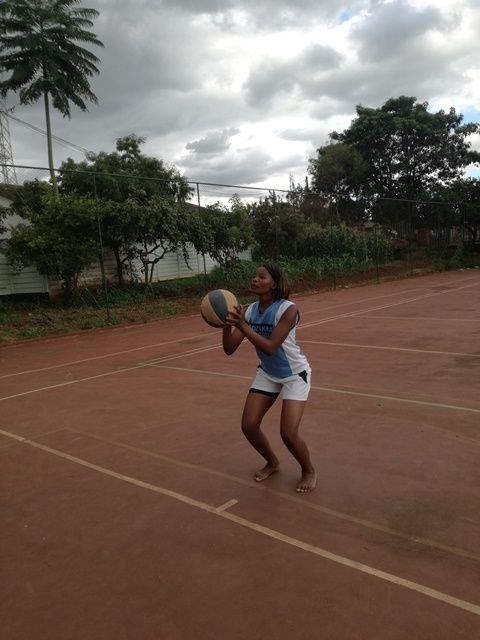 When I was in Form three, I got a scholarship at Roosevelt Girls High School in Harare through basketball. I had to repeat Form three at Roosevelt High and I then completed my Ordinary levels. My ‘O’ level results, however, were an eye opener, a great relief, a joy to the family and a source of motivation. I was impressed with my passes because throughout the years I was performing below average and my family had lost hope in my academic performance. 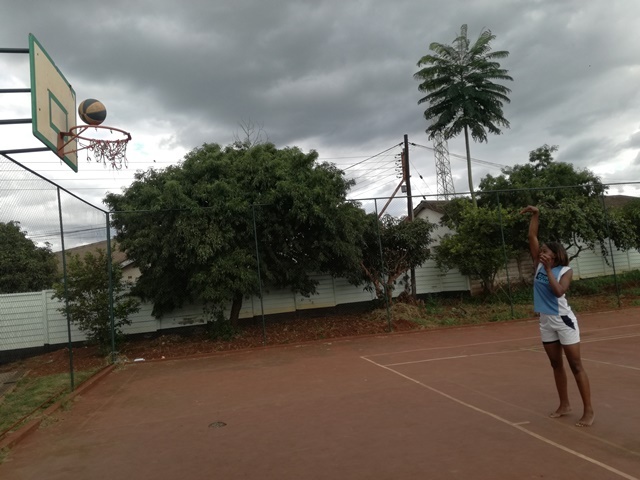 I was doing well in basketball at school and in performing arts at Dzikwa Trust Fund. I play basketball with a passion. I am proud of my 10 medals that I have won in basketball tournaments. The high point was being the captain for Junior National Basketball Team in 2015. With Dzikwa Culture Group I performed dances and plays at the Harare International Festival for the arts (HIFA), Harare Carnival and other functions organised through Dzikwa Trust. It was time for the last two years at high school. I studied Arts subjects at A ‘level. Throughout the 2 years in upper secondary school, I did not have pleasing academic results. I was going to school but with no idea what was going to come out of it. However, I was motivated with my elder sister Vaidah who was doing well at school. 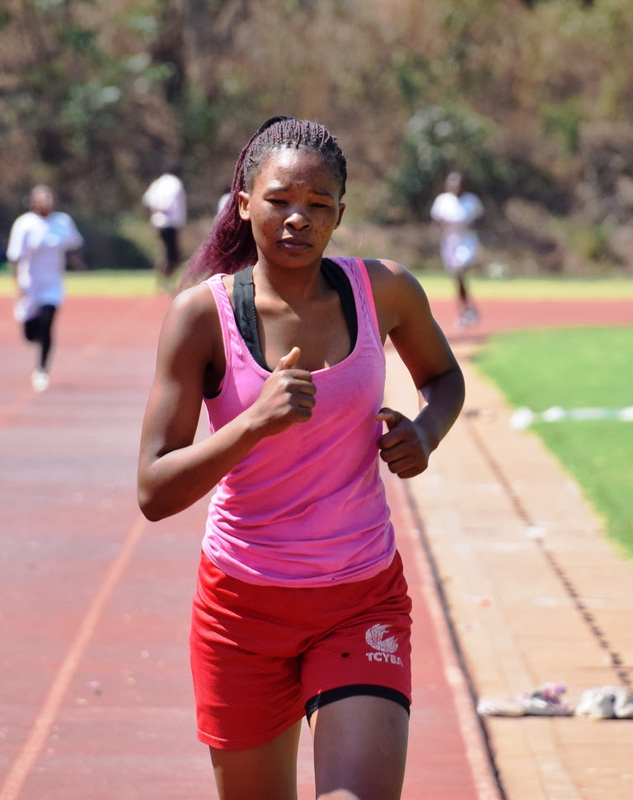 After her Advanced level results, she pursued her dream and studied Development Studies at Midlands University in Zimbabwe. This was possible thanks to her Finnish Sponsor. Seeing her in the gown on her graduation day truly motivated me. I am so happy that she is now able to proceed to do her Master of Arts in Development Studies. Inspired by Vaidah’s success, I somehow changed gears in my own studies and with determination, perseverance, sleepless nights and extra effort, I scored 10 points out of a maximum of 15 in Advanced level exams in 2018. I try to imagine a life without Dzikwa Trust. If it was not of Dzikwa Trust I could have dropped out of school years ago. My sister and I could have been married years back with several children and maybe even having been left alone to cope. According to the traditional system in the Shona culture, my mother could have offered us already to families who could pay the Lobola, the bride price. Due to poverty in Zimbabwe girls are often married at a very tender age. They think that if they get married the bride price will be used to cater for their family’s needs. Some girls can be sent to work as house helpers or to live in the rural areas taking care of their fragile grandparents and not going to school. I have witnessed how hard life can be if the orphaned girl-child is uneducated. Today, my future is ahead of me with new possibilities. I am very much indebted to Dzikwa Trust for taking me this far and giving me the opportunity to discover my strengths. Education is the key to change my dreams into reality. Besides, I have learnt essential values of life, such as caring for others, responsibility, honesty, setting goals and reaching them through hard work and determination. 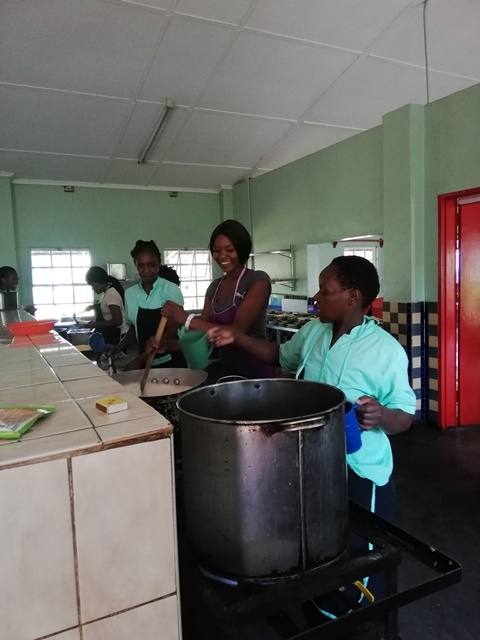 Being under the Dzikwa Trust Support Programme has given me a strong foundation to tackle challenges and even hardships in life, and I know that I have a truly extended and caring family in Dzikwa Trust for ever!